A while ago, New York City police apparently cracked down on cyclists by issuing a bunch of tickets for failing to use the bike lane. In response, there was that funny YouTube video about staying in the bike lane at all costs. As that video was going viral, someone e-mailed Eugene Bicyclist Central wondering if cyclists in Eugene got ticketed much for failing to use a bike lane. But this question got me wondering: Do cyclists in Eugene get cited much? And if so, what for? So I asked the police for some statistics and then made this fancy little bar graph. I’m not sure why EPD delivered the data for this rather odd range of time, but I don’t think it matters much. It is probably a representative sampling. Oregon’s bicycle helmet law applies to people younger than 16. Careless driving, I’m told, is often some kind of maneuver that results in a crash — but doesn’t rise to the level of reckless driving. What I have categorized as citations for not having lights, involved some educated guessing, with the help of EPD information officer Jenna B. McCulley. A ticket for a lighting violation could come under several different laws. We assumed that citations for an “unlawfully equipped bike” meant not having adequate lights. While I think that is likely to be true in most cases, I suppose a few of those might actually be something else — not having handlebars or something. Who knows what people try to do out there from time to time? And did you know, there’s a specific law saying you must have a seat on your bike? I rest easier knowing the Legislature was on top of that one. If you are interested, you can see the raw data Eugene Police sent me in this PDF. By way of comparison, I also asked EPD for some rudimentary data on motorist citations in Eugene. Although the time frame doesn’t match exactly, here is a comparison of cyclist citations (for the 12 months June 2010 through May 2011) with a few of the more common motorist citations (for the calendar year 2010). I don’t think we can say the number of citations issued necessarily corresponds to the frequency of the violation. But it may say something about the police department’s priorities. So I’m happy to see drunken driving near the top of the list. I don’t know about you, but it was alarming to me, how many people seem to be out there driving while suspended. Anyway, if you’ve ever gotten a ticket on your bike, tell us about it in a comment. I’m actually surprised at how few motorists are cited for speeding. In an urban environment, speed greatly increases lethality in car/bike car/ped crashes. Would like to see citations for distracted driving (cell/texting) and failure to yield to peds be more common. 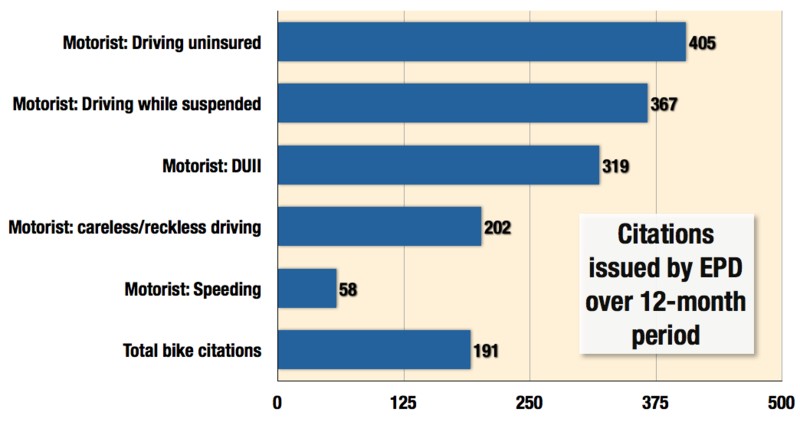 Yeah, I was going to include the number of citations for driving while using a cell phone. 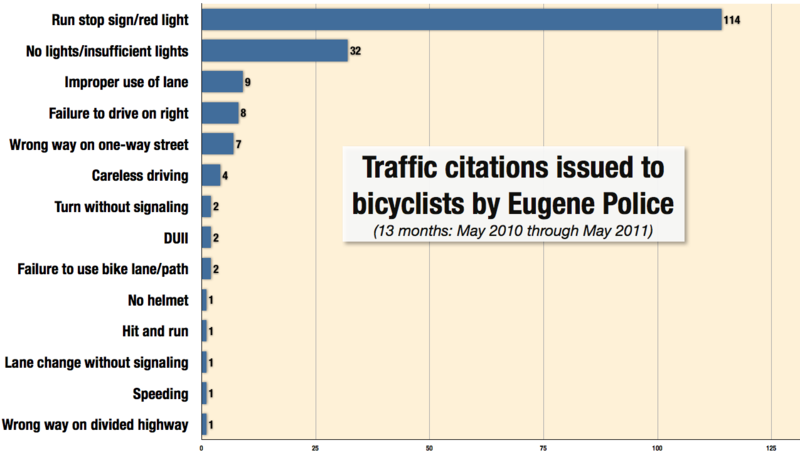 I count 10 citations in Eugene for all of 2010 — in the data I got from EPD. But this is still the law that has the big loophole that it’s OK if you are using it in the “scope of your employment” or something. The Legislature closed the “employment” loophole this past year, but I think the new law doesn’t go into effect until Jan. 1. Somebody correct me if I’ve got this wrong. They should get tickets for ending sentences with prepositions. Well, I never bought into the “rule” that it’s not OK to use prepositions to end sentences with. That’s an old hobgoblin, and go tell your grammar teacher I said so. Someone was cited for speeding on a bike? Am I reading that correctly? I’d love to hear the story behind that one. I’m imagining a high-speed chase with a dozen police cruisers casing one child, furiously pedaling a small bicycle with tassels on the handlebars. Yeah, I was curious about that one, too. Maybe I’ll see if I can find out more. I could easily have gotten speeding tickets many times while coming back into town on Chambers St. from my rides SW of town. While on her bicycle once my wife got a warning (thankfully no ticket) from a motorcycle cop for…wait for it…not stopping behind the white stop line at 15th and Willamette. The cop actually stopped his motorcycle in the middle of the intersection to berate her. I like the new snow feature on the website! Yeah, I think there are a number of places in town you could technically be speeding pretty easily. Yeah, the “snow” is a WordPress holiday feature. I wish they had rain, too. I hope that bike salmoning falls within the scope of “improper use of lane” and is ticketed. Good point. I’m not sure how that would be ticketed.